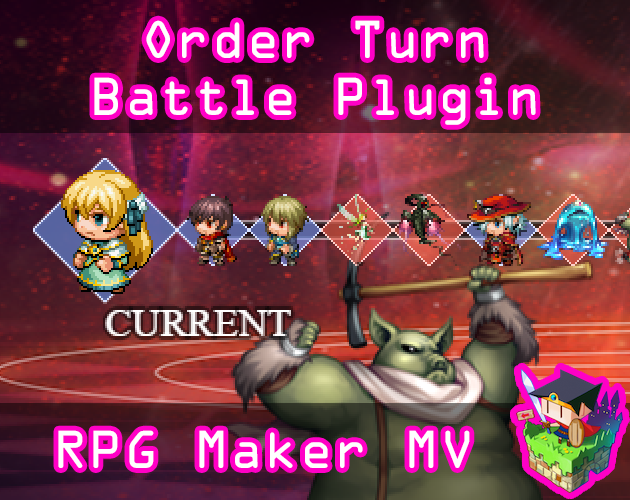 This is a RPG Maker MV plugin that changes the battle system to have a turn order system where battlers act immediately after inputting actions. It is called Order Turn Battle (OTB). These actions can influence the order position of battlers in the current turn or the next turn. 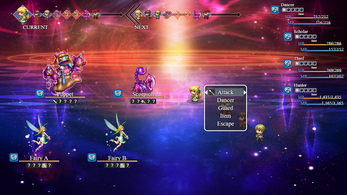 The turn order is displayed to the top of the screen and gives the player a clear understanding on whose turn it will be making it easier for the player to formulate strategies and adapt to the situation in battle. This plugin requires Yanfly's Battle Engine Core because it uses a lot of of the code used to make the battle system feel natural. This is also to utilize the key functions that come with the Battle Engine Core to make the more interesting effects of the Order Turn Battle work smoother. If you are using other plugins, place this plugin as close to the BOTTOM of the plugin list as you can or else some features of the other plugins may override the battle system and it will not work properly. Mechanics: This section in the plugin parameters lets you change how the battle system operates like automatically converting Item and Skill speed into a notetag effect for OTB. This also lets you decide if some mechanics will work in OTB or not like Action Times and how to position the extra actions added to the turn order. 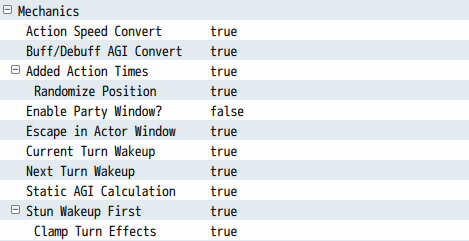 Also determine if the AGI calculated for the position in the turn order to be static or random. Visuals: This section lets you decide how the visuals added to the battle system will look. This will mostly affect the turn order display. 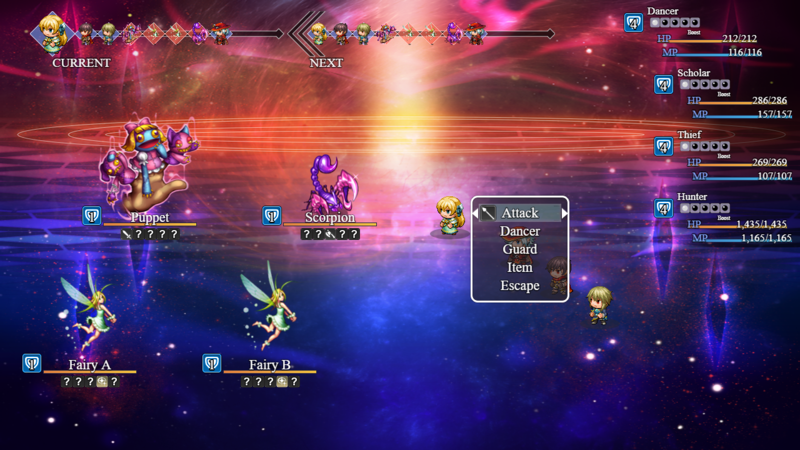 There is not too much to customize except for some text, colors, and font sizes, because everything is made to look compact in order to maintain efficiency and not consume too many of the game's resources when it is in operation. 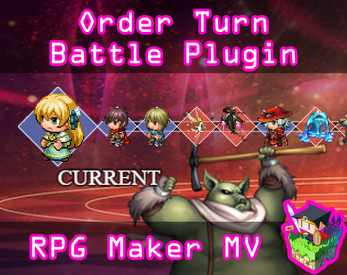 Change the user's turn order position for the next turn upon using this skill or item. This will only occur once upon usage, no matter how many times the battler hits the target. This will make a preview appear where the battler will be placed next turn. Change the target's turn order position for the current turn, the next turn, or the following turn. If you are using the 'Follow' version of the notetag, the turn it will modify will depend on if the target has acted during the current turn. If it has acted, then it will affect the next turn, otherwise, the current turn. Successfully attacking the target multiple times will also affect the target multiple times. This will make a preview appear where the battler will be placed in the appropriate turn section. Because this is made with Battle Engine Core, you can change your game away from OTB if you want to. However, if you do, make sure you have the plugin parameter: "Force Battle System?" set to false. Place this plugin under those in the Plugin Manager list. Otherwise, the effects of the plugins under this plugin may not work properly. I am NOT responsible for the compatibility of plugins not shown in the above list. 2. 'Fallen Angel Olivia' and 'Yanfly' must be given credit in your games. Sep 18 2018: Added fail safe: prevent force actions from being used on Turn 0 when action orders do not exist yet and a warning message. Please use Turn 1. <Custom Action End Effect> notetag added for OTB. Compatibility with Yanfly's Actor Party Switch now works with OTB. Oct 7 2018: OTB now works with KEL Yep Dragonbones Integration.